The year was 2002. It was a different time for video gaming. Our socks had just been rocked by the mind blowing “how did this get past the ESRB?” Grand Theft Auto 3. Critics were raving that “sandbox games are the wave of the future,” and that “linear games watch out, GTA is here to stay.” In my eyes, Rockstar games was the video game equivalent of Jesus. Rockstar was here to teach the gaming industry what it should have been doing all along. After the media storm of Grand Theft Auto 3‘s release, Rockstar was ready to announce their next prophecy, and oh boy was I excited. I didn’t even need to know what it was called. I already knew that this was a game that I needed in my life! “Chaos” was the first word I remember reading to describe State of Emergency. Followed by “Guns” and “Crowds of people” … “You’re put smack in the middle of a Riot and you need to create chaos in order to score points!” Pictures were shown of people running scared as the player mowed them down with an AK47! The concept sounded ridiculous, the company behind it was god like, the hype was bigger than life, and the screen shots sealed the deal. So at this point you’re probably asking yourself “how in the world could this masterpiece possibly be a Hangover game?” Well, you’re not hung over unless you have a little fun first. Oh how reality struck on this when I pressed start. This is not some grand adventure where you can go anywhere and do anything. In some ways, I want to say that Grand Theft Auto‘s violence was justified by its story, much like similar movie franchises. With State of Emergency, there was really no point other than “stop the corporation forces from…” Well, stopping you from rioting, I guess? Screw them! I’m rioting because… wait… why am I rioting? Oh right, because everyone else is rioting. What was Rockstar trying to achieve here? Was this supposed to be an “arcade like” experience? If so, why would I want to pay $50 for a 50 cent experience? Aside from the clunky game engine, the mediocre graphics and 90’s arcade sound design. The aspect of this game that really puts it in a class of its own is the blatant violence. Sure, there are plenty of games that are overly violent, most of them are even from Rockstar. The difference is, all of those other games have a primary focus for the game that is not centered around obscene violence. Grand Theft Auto is a Godfather/Goodfellas/insert random mob movie here, style game. Obviously within the context of a story like that, there will be violence. Mortal Kombat is a mixed martial arts fighting game; broken bones and blood are a byproduct of being punched in the face by a guy with 4 arms. Fallout 3 is about finding a clean water source and trying to supply the post apocalyptic Washington DC with clean water to survive. Obviously, within a radioactive war torn environment inhabited by giant ants and super mutants, you can expect a few heads to fly off. The point is, all of those games feature intense violence, but the violence is not the primary focus of the game. Some people run around in GTA killing everyone, but if you stay true to the story you may be asked to kill someone in order to continue the plot line, much like in films. Mortal Kombat does not require you to rip anyone’s head off, and in some cases allows you to even turn the blood off. Fallout 3‘s graphic amount of gore is a perk obtained by choice. State of Emergency is just chaos. The main focus is to create as much violence and kill as many people as you can within a time frame. 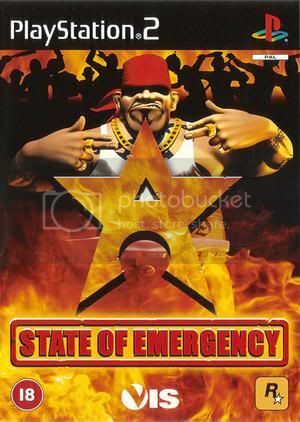 State of Emergency stands for everything that people blame other video games for – it is the flag that anti-violent gaming enthusiast can wave and rub in our face. That is why this game is terrible. I could argue the lack of replayability, the boring controls or the behind the times graphics (even for 2002). But in the end, this game fails because it puts a loaded gun in the hand of anti-gaming protesters, a gun that we have zero defense against. We can’t even say, “it’s violent, but it’s fun to play.” Because it’s not. At this point though, I can’t help but notice the similarities in the overall design of this game with Dead Rising. A cult classic on the 360 and typically not brought up when violent video games are discussed. What is the main goal or purpose of Dead Rising? Survive in the mall for as long as you can from the zombies. Which is odd, because that’s pretty much the same goal in State of Emergency. Is it because zombies are dead people and that makes it okay? When you think about it, no matter what type of media it is: video game, movie, TV show, books, etc. Nobody ever uses zombies as a reference to how terrible and violent media can be. If you take anything with zombies and replace them with living people, the context changes dramatically. Dead Rising would be State of Emergency in HD. The Walking Dead TV show would be a slaughter fest of people, including children. Which would sit very differently with people than it does now. So am I saying that State of Emergency would have been better with zombies? Morally? Probably. Practically? No. Even if you remove the moral dilemma from the equation, and the fact that it came off the coat tails of an industry changing classic video game. This game would still be terrible. There is nothing redeemable about this game and the fact that I paid $50 for it day one, and then traded it in a couple years later for 50 cents. It’s a suitable punishment for having supported this train wreck in slow motion.